In case you missed it, the story behind Mariah Carey's new Lollipop Bling trio is that Carey's husband, Nick Cannon, proposed with a ring hidden in a Ring Pop package. So the three new candy-inspired fragrances — Honey, Ribbon and Mine Again — were made in partnership with Topps, the makers of Ring Pops, and when they appear in mass market stores next year (right now they're at Macy's and the like) they'll be marketed alongside actual Ring Pops. Honey was my favorite of the three, but that isn't exactly saying much. It's supposed to be the "bright and sunny" entry, but it isn't the light, sparkling and fun summer scent it could have been: it's mostly sweet pineapple over your basic floral musk. It's heavier and flatter than I expected, and it fizzles out to "random leftover perfume smell" fairly quickly. Ribbon is the only one of the three that was inspired by an actual Ring Pop flavor: Blue Raspberry. Happily (or not, depending on your perspective) the lollipop blue raspberry is mostly in the top notes; after that, it's your average celebrity fruity floral — it does not smell like any particular fruits or flowers so much as it smells like your average celebrity fruity floral. It's perfectly wearable if not particularly interesting. It stays vibrant longer than Honey, but still, it does not stay vibrant for as long as you'd expect for an Eau de Parfum. I was hoping Mine Again, the chocolate raspberry + magnolia entry, would be great fun, but it was the only one of the three that I found unpleasant to wear. On me, it smelled like chocolate cola + melted plastic for an unforgivable length of time before settling into something I could bear, and of course, it has the best longevity of the three. If you were dying to try it, hopefully you will have better luck. If you were after some fun candy for summer, these are worth a shot, but I do think you can do (much!) better: the DKNY Delicious Candy Apples trio, to name just one example, were far and away better than these. If you're after something cute from a celebrity, I'd go for one of the Gwen Stefani Harajuku Lovers (or the newer Harajuku Lovers Sunshine Cuties): the fragrances aren't genius, but at least the packaging is great fun. 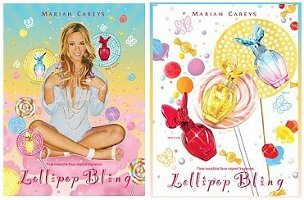 The Lollipop Bling trio fragrances are not inspired, and the bottle is the same as that used for the M by Mariah Carey and Luscious Pink fragrances (both of which were better than these). Mariah Carey Lollipop Bling Honey, Ribbon and Mine Again were developed by perfumer Laurent Le Guernec; they're available in 30 ml Eau de Parfum for $35 each. Nice review. Mine Again was my favorite. Honey was Live Luxe and I can’t stand to smell that scent. Will you ever review Fancy Nights, Robin? Yes, but probably not for a few more weeks — I find it too heavy to wear in the heat we’re having these days. Thanks for the review! I may get the honey fragrance in a year or so when they’re trying to get rid of them at TJMaxx. I was disappointed that the bottles were the same as her other scents. Couldn’t they have made them look like ring pops? At least the ‘shopped picture of Mariah is amusing. Oh, I KNOW – ring pop bottles, or bottles with a ring pop cap, would have been really cute. I mean, I still probably wouldn’t have bought one, but at least the marketing tie-in would have made sense. They really should have at least done fun bottles, I agree. Hard to see the appeal here. Mariah sweetie – you’re an adult now. Time to admit that you’re never going to be 19 again. Enough with the cutesy Ring Pops and blue raspberry perfumes. Hey, but she could make a mint selling these to the young — her age is besides the point. I just don’t think they made the packaging fun enough to get that market all worked up. Exactly. Isn’t her husband famous for being on a Nickelodeon show? I think she is still a draw for the teen/young adult market even though she left her teens many moons ago. And I might have bought a perfume in a ring pop shaped bottle for nostalgia’s sale and it would be even better if I could buy it in the candy aisle! Ring Pop shaped bottles would have been perfect, and for that matter, they could have just done solids in actual rings — that would have been perfect, and then it really wouldn’t matter what they smelled like. I hope someone enjoys these. Thanks for filling us in. I hope so too. I don’t know who it would be though, other than serious Mariah Carey fans. I might have actually gone for a nice blue raspberry Ring Pop smell. Oh, well. I had really wanted to smell these, just out of curiosity, but when I was in Macy’s the other day I got anxious just looking at them, and ran out of the store. I’d rather go on believing that they are all full of Ring Pop-y fun instead of being disappointed by the reality. Well, do try it. It’s got that “blue flavor” smell for a good while. “Blue “flavor” is enough to get me to seek this one out for a sniff, but now I won’t set my hopes too high. Harajuku Lovers set the bar pretty high for cheap celebrity scents – cute bottles and fun scent blends even though none of them really cry out to me. I hope Katy Perry Purr follows their lead. Yes — hope that one is a “fun” bottle. I’m not sure that even if the scents were great, I could bring myself to buy a product called “Lollypop Bling.” Just stuffy, I guess… BTW, I sniffed Fancy Nights the other day, but I had the same response to it as I’ve had to the other “Fancy” scents – only more so: cough, hack, wheeze, yuck! I bought those Harajuku Lovers doll heads, so I can’t hardly turn my nose up — except these just aren’t as fun. Me, too. Super kawaii!! I just need some Hello Kitty perfume to round out my collection. I quite enjoy outrageously trashy perfume if its actually fun- these are kind of boring scents and they missed the boat on the packaging. They must have spent most of their creative efforts on the considerable airbrushing / reconstruction of Mariah’s face and body for the advertising! She looks younger here than she did 20 years ago when I first saw her on the Arsenio Hall show! Exactly — there isn’t enough fun factor in the product itself. Very surprised we haven’t seen more brands try to copy the Harajuku Lovers idea. Wasn’t there a Brazilian designer who packaged her perfume in a doll? Her name escapes me at the moment… And I could swear there was a line who made dolls around the holidays in commemoration of their anniversary, but my brain just can’t come up with names at the moment. I didn’t expect much from these and do wish the packaging had been much more creative. If they’re dirt cheap on the discounters, I might pick them up. I’m still waiting for the DKNY Candy Apples to go that route since all of them looked adorable. The 2nd one you could color in w/ pens they included. Very cute. What you have to go through for this blog! Robin, you are brave! Though, yes, since it’s your blog, you can choose to review whichever perfumes you want – you don’t HAVE to review Lollipop Bling. I give you great kudos for testing these types of scents, though! I suppose I assume most of them are not worth trying, but there’s also the challenge of the hunt – will there be a winner amongst all the fluff??? Yes, thank you very much. I don’t think that the HJ Sunshine Lil’ Angel (? – the one with the headband and short hair) is bad at all. I think Katie Puckrick said it was a non-edible vanilla along the lines of Kenzo Amour and might even make a nice masculine for anyone brave enough to try it. I didn’t try the Sunshine Lovers on skin, but I liked the original “G”…and I think they’re doing some new ones later this year. I love it, Robin, that you do these celebrity perfume reviews. It can’t be niche this and extrait that all the time! But “random leftover perfume smell” and “melting plastic” are exactly the bad potential perfumes that could be fun and pop-esque have. Boo! They really could have done a much better job on these. Just thought of another “better” set at around the same price: the Benefit Crescent row trio, although I haven’t yet tried the 3 new ones for this year. What would a Pop Rock perfume smell like? Pink Sugar is not all that far from Sugar Daddy, no? Pop Rocks could be done with all those mineral molecules, I’d think. I only know SNZ as a band… what are they? One of the reasons I enjoy this blog is the wide variety of perfumes reviewed. Not everything is “top shelf” or niche or however you want to put it. Thanks for the variety. I gave my niece the Benefit Crescent trio last year for her birthay and she enjoyed trying them. It seems she had fun sharing them with her friends so perhaps more than one girl was touched by a decent scent! I thought those were just fine, and that packaging was cute as the dickens. These aren’t really as good as those…almost like they were just going through the motions and couldn’t be bothered w/ the development aspect. I’m wearing EL Private Collection (the original) today. Scent and stylewise that’s as far away from Lollipop Bling as could be imagined, but its still fairly mainstream department store stuff, and not expensive. Thanks for taking one (or three) for the team Robin! I’m not usually one for “cute” or gimmicky bottles….I don’t even really go for the many limited edition bottles…. But I’m able to recognize a well done cute bottle—and I really think they dropped the ball on this set. This set is all about the gimmick…and yet they didn’t follow through on the gimmick! Obviously these people are in it for the generation of revenue, not the creation of amazing fragrance…so it just seems about 20 IQ points below reasonably intelligent to totally miss that opportunity! And since I already sound like I’ve been sucking lemons today, let me just say that very seldom do I actually feel nauseated by the time I finish reading the notes of a fragrance…these babies are practically a “dietary aid”. I’m totally with you. The only reasoning I can come up with is that good packaging design can be expensive, and Topps didn’t have the time or the dough. I knew someone who designed packaging for Coty, and he had to consider safety, stability, shipping costs and myriad other factors – just to slightly modify existing containers with new caps. And it took three months! I doubt Topps had anything to do with it…her fragrance license is with Elizabeth Arden, and I’m sure they’ve just paid Topps something to be part of the deal (or Topps just agreed for the publicity, who knows). So the blame goes to Arden, I would say. Chocolate cola + melting plastic sounds rather avante garde non? It could be Comme de Carcon’s summer scent “Odeur 31: Stuff spilled on the boardwalk”. I remember reviewing these a while ago for examiner.com. I actually thought Ribbon was the best one. It was also the bestseller at Macy’s in Philly. None of them were that great, but I smelled a cantaloupe candy note at the end of Ribbon that was interesting. Interesting, thanks! I’ll look for them.